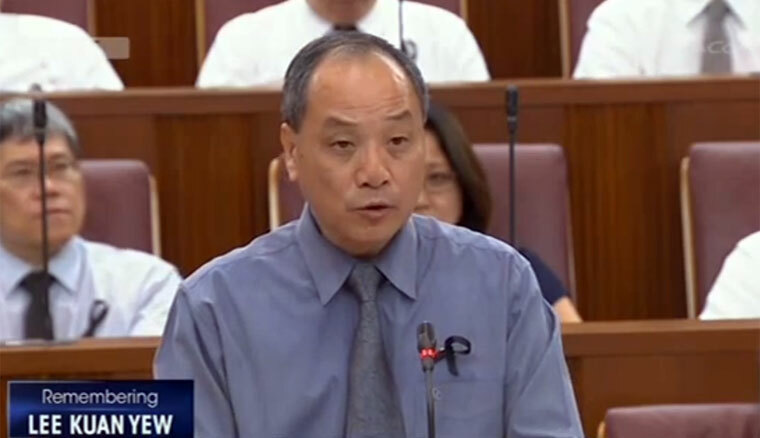 Mr Low gives a tribute to LKY in Mandarin, at a special Parliamentary session. Founding Prime Minister Lee Kuan Yew was an extraordinary political leader born out of that turbulent and uncertain era. Singapore at that time was a small island and an unnoticeable city, economically, it relied on entreport trade; militarily, it relied on the protection from the British troops. When Singapore was forced to leave Malaysia, I do not think many would have believed that Singapore could survive on its own for long, not to mention to have imagined our achievements today. We all know that during that period, the country was to be rebuilt from scratch and there was high unemployment rate. Our neighbours were not particularly friendly either. To survive, we must have a global vision, attract foreign investment and link up with international market. However, this could put Singapore in danger of becoming a vassal of the big countries and a pawn in the international political arena, which can be sacrificed at any time. These internal and external challenges were a grave test for Mr Lee. With outstanding wisdom and courage, he traversed amongst the big countries and promoted Singapore’s values to them and the potential benefit that Singapore can provide. He had won the respect of the leaders of these major powers. Without his efforts, our economy could not have been successful and Singapore could not have achieved its international status, and possessed the political space today. For a small country, besides a strong military defence, the political space in international politics is the key to maintaining national interest and its survival. In Singapore, fighting for independence and the continuous political struggle awakened the Singaporeans’ political awareness. In the process of political movement and fighting together, consensus was forged between the people and Mr Lee, as well as a common direction and mutual trust. This is the main reason why Singapore can leap from the Third World to the First World within one generation. The success arose not just from Mr Lee’s extraordinary fighting spirit and tenacity, but also from his sincerity. However, I do not think that the political structure of PAP one-party rule is the key to Singapore’s fast economic development, maintaining social cohesion and national unity. This is because many Singaporeans were sacrificed during the process of nation-building and in policy trade-offs, and our society has paid a price for it. Mr Lee is thus also a controversial figure in some people’s eyes. He crafted policies based on the situation then and made rational judgement in the interests of the country. However, the choice and implementation of policies should not be just rational. It should also take into consideration humanity and sensitivity. Only by doing this can we avoid hurting people and creating resentment. If accumulated over a long time, the resentment could become a potential political crisis and affect people’s unity and their sense of national identity. From my dealings with Mr Lee in Parliament, I do not think he was an autocrat who did not listen. If you have strong reasons and tight arguments and can win him over in the well thought-through policy debate, I think he will consider your views. I also know he was someone who hated empty talking because he thought time was precious and there were many more things to be done. Singapore is a multi-racial society and every race has its own language and culture. In the early years of nation-building, everyone hoped to maintain their advantages in this new country. How to manage the various conflicts of interests, unite people and build a national identity was a tremendous challenge. Countries with similar situations as we were in the early days are still facing social conflicts brought about by multi-racialism and multi-culturalism. Some even faced the danger of disintegration. Singapore today is united regardless of race, language or religion. This is an achievement that is not possible without Mr Lee. My deepest respect goes to founding Prime Minister Mr Lee Kuan Yew.